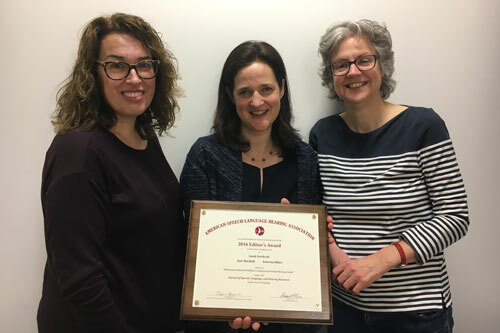 Researchers from the School of Health Sciences at City, University of London have received the prestigious Editor’s Award for their paper in the language section of the Journal of Speech, Language and Hearing Research. Awarded at the American Speech-Language-Hearing Association convention in Los Angeles, California towards the end of 2017, the prize was specifically given for a paper by Dr Sarah Northcott, Professor Jane Marshall and Professor Katerina Hilari which looked at how social networks are affected following a stroke. In the study the authors explored how social networks change following a stroke and analysed what factors predict who will have a strong social network. Participants were assessed two weeks, three months and six months post stroke on a range of assessments including a complex measure of their social network. In total 87 participants were recruited (37 with aphasia) of whom 71 were followed up at six months. They found that social network scores declined post stroke. Whereas contact with children and relatives remained stable, contact with friends significantly weakened. There were only two factors measured two weeks post stroke that predicted social network six months later, these were: pre-morbid social network and presence of aphasia. Presence of aphasia – where the communication centre of the brain is damaged, resulting in difficulty talking, understanding, reading or writing - was a stronger predictor of having a weakened social network than either stroke severity or physical disability. The article highlights the vulnerability of social contacts following a stroke; having a language disability appears to make someone particularly at risk of becoming isolated. Stroke rehabilitation should consider how the stroke is affecting a person’s social relationships in order to support the person with stroke in navigating their recovery. In particular, social relationships provide the context in which communication takes place, so make a vital contribution to aphasia and language rehabilitation. Northcott, S., Marshall, J. and Hilari, K. (2016). What factors predict who will have a strong social network following a stroke? Journal of Speech Language and Hearing, 59(4), 772-783 doi:10.1044/2016_JSLHR-L-15-0201.